Well, I'm feeling a bit lazy this morning, so I'm just going to go straight to telling you about my favorite Etsy find for today. 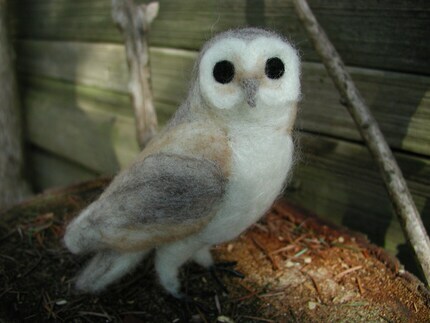 It's actually 3 separate hand-felted sculptures by Farmlass. Try as I might, I couldn't pick just one! These little beauties are not only gorgeous, but are also just oh so sweet and soft looking; you just want to pick them up and pat their soft little noses! They obviously took a great deal of artistry and skill to create. 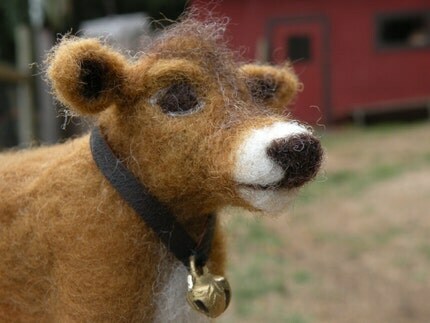 I love how the artist seems to capture the essence of the animals in her creations; in their stances, the way they hold their heads, and their expressions; these are truly needle-felted sculptures, not simple playthings. Edward measures 6" long by 5" tall and comes in a whimsical handmade linen gift bag. Who knew owls could be so beautiful? 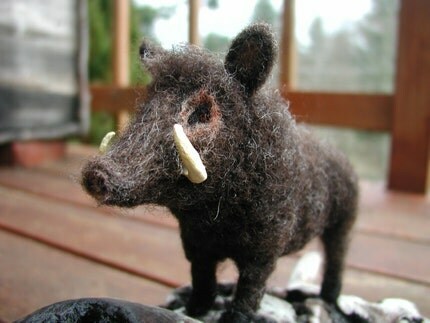 I always knew pigs were cute, but this little wild boar is truly adorable, and has such attitude! Ivan measures 4" tall by 6" long. The very essence of a sweet, gentle dairy cow! Buttercup measures 4 1/2" tall and 6" long. I think she might be my favorite, but then I look at the others, and I'm not so sure! Leave a comment if you like and tell me your favorite. It would be so interesting to take a poll! You can find these lovelies, along with many more of Farmlass's handmade creations, at http://farmlass.etsy.com. Or you can click an of the above photos. If you'd like for me to check out your shop, leave a comment with a link at the bottom of this page. Thank you for such a kind review of my sculptures...it's always inspiring to hear that someone can see the work and love which I put into my sculptures...plus they are really fun to watch emerge from a big ball of fluff! Cheers.